Note: this build is not a league starter, it is designed to push the bow character to its limits, and to pose as an alternative to phys bow builds. This guide is a continuation of Pasta's previous dex stacking build; since he is banned, someone needs to take up the mantle, and here I am to take it--but there is a significant divergence from his former build. There is a lot of variability in this build in terms of skills and gear, and you can pretty much run any bow skill you want with these key items. This is a work in progress build. If there is any legacy variant in my gear it can be ignored and the nerfed version will still get you well over 10 million dps. This is with some mirrored gear which you can get using the following links. If you wish to mirror the shop owner's gear, please tell them I referred you! This isn't a mirror service advertisement type of guide. You can make a 20 ex~ build clear all content in the game. This is simply the gear I use on my character. This is a more realistic pastebin, with gear that is absolutely attainable in league, roughly 50 exalts worth of gear, and it still hits 25 million shaper dps. Chimera doesn't even have time to enter hidden form! After I killed him I realized I didn't have my jewels equipped, will post another when I find him again! I'll get around to posting an uber elder video once I can get him to spawn. I'm playing an elementalist in league right now so it might be a little while. Pathfinder is required to avoid status ailments, which allow us to pick up more damage flasks! Justification: For this build, Deadeye will yield similar damage, but suffers in that too many flasks will have to be given up to avoid status ailments. Therefore, Pathfinder is the best, since the flasks here are so important. You can use a Cyclopean Coil to counteract the problem of ailments, but you will not be able to achieve more intelligence than strength under normal gear circumstances. And you will obviously never be able to avoid ignite. Bandits: we will choose Alira, since it gives an incredible amount of damage, and this build is very, very hard to resist cap. Major: Soul of Solaris is best for this build, we don't need to use the others for status ailment avoidance. Minor: I use Soul of Shakiri for delving, Soul of Yugul is good for uber elder. Since we are trying to make use of as many flasks as possible, we need to take "corrupted blood cannot be inflicted on you" on one of our jewels. Therefore, Soul of Ralakesh can be useful if you find you die to normal bleed. With the Chain Buff in 3.6, Lightning Arrow can once again melt mobs instantly and is the fastest trash killer without question. When to choose TS over LA? When you have low damage or are deep delving. LA is used specifically so we can achieve the fastest clear speed possible in T16 maps. With Headhunter, you won't even need to use this in maps. You can replace Hypothermia with Elemental Focus if you feel like you are shocking your enemies sufficiently with Lightning Arrow (this will be discussed more in-depth in the gear explanation section). If you opt to use portal scrolls instead of the gem, swap that with Faster Projectiles Support. If you're using a helm with 3 sockets due to an abyssal socket, drop Enhance. Herald of Ice adds about an abyss jewel worth of damage to this build, and helps our clear. Assassin's Mark+Curse on Hit allows up to generate power charges, and you can substitute Innervate for Ice Bite if you want to use Herald to generate Frenzy Charges. If you go that route you can replace Ice Bite in our bow with Hypothermia, Added Cold, or Damage on Full Life Support. An assassin's mark on hit ring allows us to drop 2 gem links, in a build that is hungry for sockets, so I highly recommend it! With the buffs to hatred in 3.6, there is no longer a question on what aura we use. The more cold damage it gives is perfect for this build. Blood Rage and Ice Golem give you a nice buff, and Frost Bomb makes the enemy take much more damage. Personally, with my level of gear, I don't find Ice Golem or Frost Bomb to be necessary, and so I replace them with a level 1 Cast When Damage Taken and a level 1 Immortal Call (optional: 20/23 Increased Duration Support linked to them). Vaal Haste gives you more boss damage if you are fighting a boss where you can collect souls. Vaal Grace gives you 34% attack/spell dodge. That's more than a free Acrobatics/Phase Acrobatics. If you're pushing 100 it's the most OP single gem slot in the game. Link increased duration support to make this puppy last over 10 seconds. This tree was designed to maximize dexterity while grabbing as many damage and socket points as possible. If you choose, you can drop damage for life. My recommendations for defensive nodes would be Thick Skin, followed by Revenge of the Hunted. Losing damage for Acrobatics and Phase Acrobatics can be worth it as well. If you find yourself running out of flasks too often--which shouldn't be a problem--you can take druidic rite. If you don't have a multimodded bow, and yours has high physical damage, or if you want to run physical reflect maps without having to worry about killing yourself, pick up the winter spirit notable. Link for those interested in copying Maelstrom Horn, the #1 DPS Barrage Helm. Note: For Viridian Jewels, prioritize Cold Damage>Increased Attack Speed with Bows>Projectile Damage>Dexterity/Elemental Resistances if needed. You can easily drop attack speed for Maximum life if you want. For Searching Eye Jewels, prioritize Life>Cold Damage to Attacks/Cold Damage to Bow Attacks>+# to Global Critical Strike Multiplier>+% Increased Attack Speed if you've Dealt a Critical Strike Recently. For Watcher's Eye, prioritize Added Damage>Damage Penetration>Increased Cold Damage. An Unnatural Instinct is the best jewel in the game other than Watcher's Eyes. Put it in the top left jewel slot shown on the passive tree above. 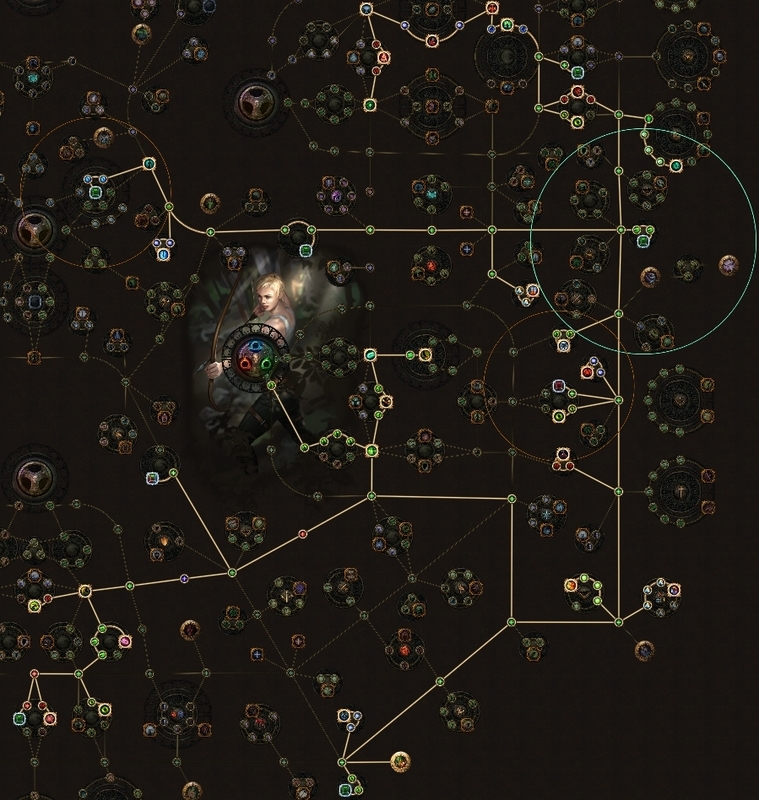 An Inspired Learning jewel is only advised for t16 mapping, and should be placed in the right hand side of the passive tree above (make sure 4 notables nearby are chosen or it won't work). Note: For this build you will need bleed/curse immunity. For this we will get a corrupting blood jewel, and utilize a "of Warding" suffix on another flask. If a corrupting blood jewel is unattainable, use a "of Staunching" flask instead. This level of gear is not required to one shot everything in the game. I can clear an UGS in about 60 seconds and Merveil goes to phase 2 the second I walk into the room, purely from Lightning Arrow coming out of my Mirage Archer. With this gear I have killed the last phase of Shaper instantly. The idea of this build is to stack dexterity (and to a lesser extent, intelligence and strength) to make use of the added damage mods we get from the following items. Previously, we thought it was best to have around 1000 dexterity. I advise getting above 700 and making use of scaling damage via increased damage, increased weapon elemental damage, damage penetration, etc. A bow with the modifier "Adds 3 to 5 cold damage to attacks with this weapon per 15 dexterity" is the most important mod--make sure it is divined to perfection or you will lose a good amount of damage. Next is double damage. A bow like this should be multicrafted. Bases that are acceptable (has to be shaped and i82+) are Imperial Bow, Thicket Bow, or Harbinger Bow (if you are lacking crit). "But Family Man, adds 3/5 cold damage can't possibly be that strong of a mod. 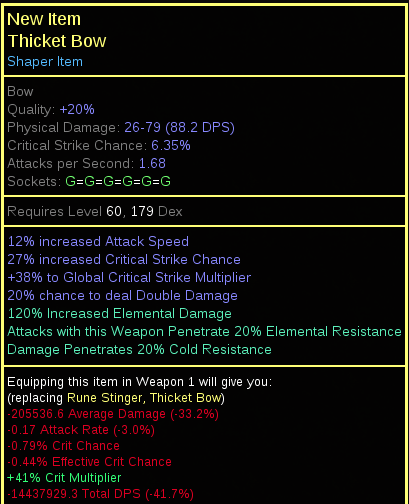 I think I'm going to go with a cheaper ele bow." I lose over one third of my damage with a perfect mirror-tier elemental bow. A Hyrri's Demise is necessary for this build, but the corruption is not. It will add an obscene amount of damage to your build however. Can it be beaten? Actually, yes. With a perfectly rolled synthesized +1 arrow base that is essence of horrror'd to have 4/7 cold damage per frenzy charge, you can manage to squeeze 3-4% more damage with a perfectly rolled one. If that ever exists, it'll cost you a mirror and a fee :) -- Hopefully in the future we will see an adds x/x cold damage that scales with dex modifier on a quiver, because no hyrri item has life on it. Yoke of Suffering allows us to shock with cold damage, which basically is a 50% more modifier if you hit above the shock threshold. In addition to that, we are inflicting most ailments on the enemies, and will get a lot of more damage from the amulet. The modifier which says 5% increased damage per ailment might be misleading to a newer player--enemies take increased damage is a more multiplier, and therefore is worth a lot of points on the tree. Also, it has really nice resistances. Important Note: Due to the amount of projectiles barrage looses, you will NEVER shock a boss with enough damage in one hit to gain 50% more damage. This amulet is used for inst-clearing maps and map bosses. You can still use Yoke for bossing, but a rare amulet or an Eyes of the Greatwolf with increased stats will yield higher damage, if used in conjunction with a focus shock craft on a rare ring. Helmet: a crafted helmet with +1 barrage enchant should have the following stats: High life roll, with the delve percent life>High Dex roll>Nearby Enemies have -9% to Cold Resistance>Abyssal jewel slot or resists to meet your needs. Again, capping resists is difficult on this build. The crafted modifier "8% of Physical Damage from Hits Taken as Fire Damage" is a really nice boost to survivability. Hyrri's Ire is a fantastic and cheap option to start this build. The amount of damage it adds for the relative cost is unbeatable. Unfortunately it has no life, and this build is lacking on life. Farrul's Fur can prove to be useful in keeping charges up during fights. It also gives a nice amount of defense. If you choose to go that route, an aspect of the cat amulet like below is a nice upgrade, though you won't be able to shock the enemies as frequently. Against bosses this is rarely an issue due to the shock threshold. (Ideally this amulet would have no life and the affix "1% increased Damage per 15 Dexterity" and 50% WED). You can craft aspect of the cat on any rare item you want, but amulets with these stats rarely have 6 useful mods, so that's why I'm suggesting it here. If you are fighting shaper only, then Farrul's Fur is better than a rare chest (vs. Uber Elder he spawns enough adds that charges are up most of the time unless you are really slow). Note:GGGs new design philosophy is that rare items should always be better than their unique equivalent, and that is the case for amulets in this build. If you want to run a rare amulet to achieve higher dps, craft "Shocks nearby enemies for 4 seconds when you focus" onto a rare ring, and you will do more damage. But these amulets are not cheap. The new synthesis ring might provide more damage than Mark of the Elder but I haven't been able to try it. Tombfists provide more damage at the cost of life. Personally, I would recommend sticking with Shaper's Touch, unless you have a nice corrupted, legacy pair with good abyssal jewels. A rare pair of gloves with "25% of Physical Damage Converted to Cold Damage" is super powerful. After I add a double veiled mod to these--via Aislin on research--these will be the best dex gloves in the game. But you can multimod one of these too with only dexterity as an affix. An abyssal socket is luxury. Helmet: For Helmet enchants best in slot is Barrage fires and Additional Projectile and Barrages fires two additional projectiles if you are in standard. Gloves: Glove enchants are not very useful on this build. It is better to get a "Attacks have +% to Critical Strike Chance", "+1 to Maximum Frenzy Charges", or "Curse enemies with # Elemental Weakness on Hit". Boots:For bossing, no one can deny the power of Damage Penetrates 10% of Enemy Elemental Resistances if you Haven't Killed Recently for mapping you can use 16% Increased Attack and Cast Speed. Body Armour: If using an Astral Plate, don't corrupt it. If you are using a unique chest, then "You take 50% reduced extra damage from critical strikes", "50% increased damage", "+1 to maximum resistances", or "+1 to socketed gems". The bonuses from these corruption implicits is substantial, but not at all necessary. Amulet: The normal implicit of Yoke of Suffering is fine, but if you want to push the limits then a double corrupt "increased dexterity" would add a lot of dexterity, and "+1 to maximum resistances" would give you a nice amount of defense. Quiver: Additional Arrow is by far best in slot, point blank saves you a point the tree, chain makes your clear better but is overkill. Flat damage is better than nothing. "Adds 3 to 5 Cold Damage to Attacks with this Weapon per 10 Dexterity" is the only absolutely crucial mod to have on your bow. You can acquire one of these bow purchasing a base (recommended), or by using the following crafting recommendations. First option is to purchase an i82 shaped bow (has to be i82 so no chaos rolls), and use the fossils Frigid>Metallic>Abberant until you hit the 3/5 mod. It's going to take a few slams before you hit it, and that's why buying a base is not cheap. If you want to spend some more currency, add a prismatic fossil into the mix and go for a legendary bow! The second option is to pick up a synthesis bow with the adds 3/5 cold damage as the implicit, or to synthesize one yourself with 3 T1 dex rolls on fractured bases (has to total 161 dex). Unfortunately you won't be able to roll 20% double damage, but it frees up a prefix, which might be more powerful--and is easier to craft, following the same crafting advice. Do not alt spam a bow unless you want to go mad. prefixes: 120% Elemental Damage (delve mod), Attacks Penetrate 20% Resistances (delve mod), 3/5 cold damage to attacks (shaper mod). suffixes: 12% Increased Attack Speed/20% Chance to Deal Double Damage (shaper mod), 38% Increased Critical Strike Chance, and crafted double damage. Hyrri's Demise adds a ton of flat damage to the build with its attributes, and more importantly, its attribute scaling flat damage modifiers. A Starkonja's with the Barrage fires an Additional Arrow enchant is the best unique helm for this build. It provides dexterity, attack speed, crit, and a fat life roll. For rare options, check out the "Gearing Alternatives" section. Assuming you are not using a Hyrri's Ire or Farrul's Fur, a crafted rare chest with Attacks Have +% Critical Strike Chance and +% Increased Dexterity will fix the low natural crit chance of our non-harbinger bow and will add more flat damage via increased dexterity. Getting flat life and percent life on a chest like this is super useful as our build won't have much life without it! Having the physical damage taken as fire mod is useful, but additional curse (if you are also using elemental weakness corrupt on gloves) or percent life is better. For a crafted suffix, use +% increased attributes. 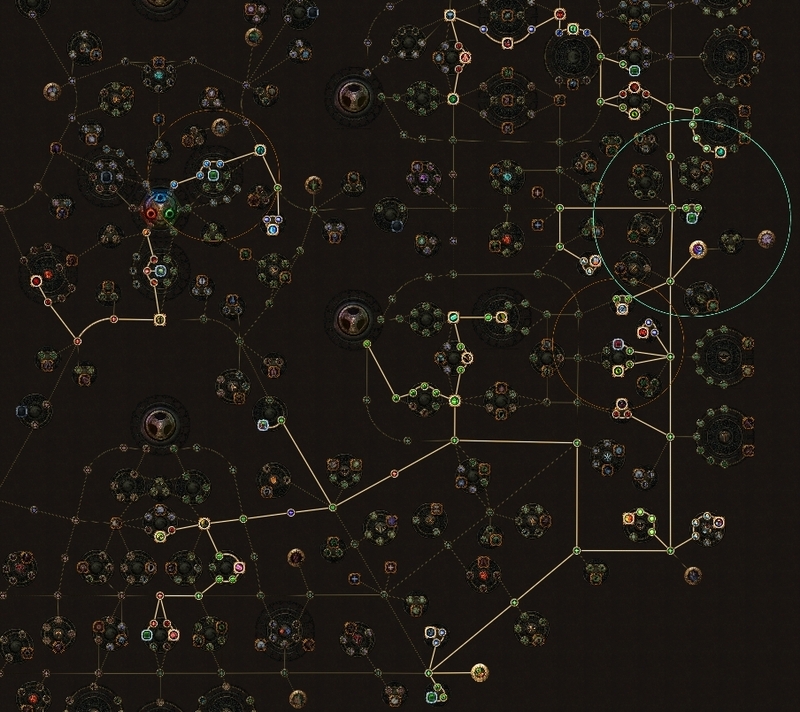 Shaper's Touch is best in slot for most attribute stacking builds, and it is for ours too. Go to the "Gearing Alternatives" and "Enchants and Corruptions" sections for more information. Boots are where you're going to pick up some dexterity, movement speed, life, and resistances. Pretty simple really. The 5% increased dexterity synthesized implicit would be nice, but not necessary. Go to the "Enchants and Corruptions" section for information on enchants. Yoke of Suffering has had a profound impact on bow element versatility due to the "Your Elemental Damage can Shock" affix. Shock is the most powerful of all elemental ailments, providing a potential 50% more multiplier to your damage. Since we deal almost all cold damage, we will never shock our enemies, so we must use this amulet to alleviate that problem. Additionally, the affix above this which states "Enemies take 5% Increased Damage for Each Type of Ailment You have Inflicted upon Them" is actually another more multiplier, and we are pretty much going to be stacking ailments with this build. Fire associated ailments might be a concern to you, but you only have to deal 1 damage of fire to inflict them. On rings, you want dexterity, life, and increased damage via cold damage or elemental damage with attacks. You'll most likely have to use rings to fill out your resists, so these can get quite expensive. If not, they'll be cheap, so it might be best to get a rare helmet or gloves with a lot of resistances. If you somehow are not having resist problems, a Mark of the Elder is very powerful DPS and life boost. Make sure your other ring is shaper touched if you use it! An assassin's mark on hit ring is useful in being able to curse bosses and free up 2 gem slots. It's a nice upgrade, but only has a .362% chance to roll on an item. Might want to buy one and multimod it. Circle of Fear is probably the best dps ring for this build, but it doesn't have life. Your call. Life, increased attributes, and as much increased damage you can get! You can stack up on resists here as well if you're low. For mapping, use a Headhunter or Bisco's Leash. Adds projectiles is the #1 way to scale barrage damage, this flask will give you 40% more damage straight up. 60% if you decide to scale increased effects (50% will give you a third projectile). This thing gives you 15% of elemental damage as chaos damage. Lots of damage. One, this flask instantly heals you and restores your mana, which makes this build feel so smooth. Two, we ignite all enemies, so this is a 10% more multiplying flask. Three, it provides Onslaught which makes us move faster and loose arrows quicker. Four, you can craft a flask modifier on it. Yea, I'm surprised this flask didn't go legacy. Really nice build! Dex stacking bowyers are really underrated. Going to try this build soon! Sure, I'll add an explanation of gear and what to focus on in each slot. As for videos, OBS tanks my performance really hard (for what reason, I don't know), but I'll try to figure something out. I really like the idea behind this build, good work. Hope you'll find some time to finish the guide. 1) You did not pick up Acrobatics, any particular reasons for it? 2) What do you think of a scion version of this build? we can add elementalist or juggernaught ascendancy to the pathfinder one, and optimize tree. 1. Great question, and picking up acrobatics is definitely something I would recommend if you find yourself dying a lot. I was rarely dying while mapping, which is what I use this mostly for, but when I did die it was always a big melee crit, so I was just trying to mitigate some of that damage. A better way would be to use a farrul's fur with the 50% reduced damage from critical strike corruption. I'm a Deadeye at the moment but I will switch over to pf once I have collected some of the gear suggested here. One question, how does pf do with accuracy issues? Ty also for fleshing out the guide!! For every 10 dexterity you gain 20 accuracy rating, so accuracy should never be an issue. And no problem! I'll add an uber elder video shortly, I ran one yesterday but I had a death so I'm not going to upload it. Someone made me aware of a new 3/5 cold damage synthesis mod on bows, so I'm gonna add that to the guide as well. Should be cheaper to make a bow that way (though you would have to craft double damage as opposed to rolling it).